Medical products make extreme demands in terms of hygiene and cleanliness. We are aware of our responsibility for products that safeguard human health. When we talk about cleanliness, we're talking about over 20 years of experience in clean-room production. We offer the entire production chain as required, ranging from laminar flow through to clean-room conditions ISO-Class 8. 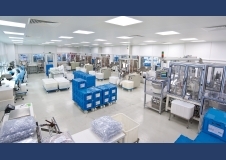 If required, we can produce, process and assemble large quantities under clean-room conditions.